After peeled or grated potatoes are expose to air they will begin to turn gray or brown. This appearance can be off-putting, but the good news is that the quality of the potato isn't compromised. This is a harmless natural reaction and it is perfectly fine to cook and eat potatoes even if they have turned gray. But there are also kitchen tricks you can use to prevent this discoloration. Potatoes, along with apples, pears, bananas, and peaches, contain an enzyme that, when exposed to oxygen, reacts to produce a discoloration on the surface of the potato or fruit. Potato skins and fruit peels are the natural ways oxygen is blocked from reaching this enzyme. Once they are removed, oxidation begins. To prevent this reaction, the enzyme must be deactivated by cold, heat, or acid, or you must provide a barrier to keep oxygen out. 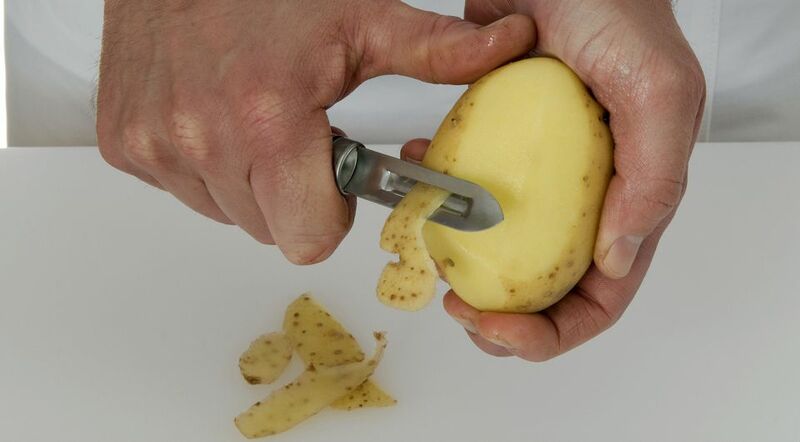 To keep peeled whole or cut potatoes white, cover them with cold water until you are ready to use them. If you are going to boil them, you can simply do so once you're done getting them ready. For other uses, drain the potatoes and pat them dry before cooking them. This trick even works overnight, as long as they are refrigerated. This works not only by keeping the potato cold, but also by preventing air from reaching it. When grating potatoes for recipes like potato pancakes, potato pie, and potato kugels, mix in a little ascorbic acid, which is nothing more than vitamin C powder. A pinch of a crushed vitamin C tablet in a little water works just fine even after the potatoes have already turned gray. The acid magically whitens them again by changing the pH, which is a measure of acidity. True to its name, ascorbic acid is acidic. Besides vitamin C, you could use vinegar or lemon juice, both of which are acidic enough to do the trick. Combine both these methods by soaking the potatoes in a bowl of cold water mixed with vinegar or lemon juice. Vacuum pack the peeled or grated potatoes to prevent air from causing the discolorization. Sometimes, gray potatoes are a good thing. In Poland, kluski czarne (black dumplings), also known as kluski żelazne (iron dumplings) or kluski szare (gray dumplings), are a variation on kluski śląskie (Polish potato dumplings). In addition to mashed potatoes and flour, grated potatoes that are intentionally allowed to oxidize or turned dark are added to the dough to give it a gray color. Although kluski were once considered peasant food, today they appear at gourmet restaurants in Europe as a side dish instead of potatoes.